I've been making 1-2 loaves of homemade whole wheat bread every week for over a year now. I was tired of the preservatives and chemicals in store-bought bread and the taste was definitely lacking. But my handy dandy bread machine should get all the credit. I would never go to all the trouble of making my own bread without one. It's so awesome because it takes less than 5 minutes to throw the ingredients into the pan and the machine does the rest. After it's all said and done, I'm left with amazing bread and only one dirty pan. And it's super easy to clean because it's non-stick. I've included my favorite whole wheat bread recipe below. Add ingredients according to the directions that came with your bread machine. Use the wheat bread cycle and light color setting. This recipe makes a 1 1/2 pound loaf. Follow the directions that came with your bread machine carefully. I first got a bread maker eleven years ago. I didn't follow the instructions and my bread never turned out. Now I make sure my water is at the right temp (my directions recommend 80°F). I spoon the flour into the measuring cup instead of scooping so I don't use too much flour. My previous bread maker recommended using bread machine/fast rising yeast so I still use that, although my new bread maker says active dry yeast can be used. I keep my yeast in the fridge so it doesn't go bad. If your bread doesn't rise, try adding 2 tablespoons of vital wheat gluten and 2 1/2 tablespoons water. Not all recipes work the same in different areas. I live at sea level. For high altitude areas, reduce the amount of yeast by 1/4 teaspoon and reduce liquid by 1-2 teaspoons until you find the right amount. This is my rockin' bread machine that I bought last year to replace my previous Black & Decker model. I was debating between this West Bend Breadmaker for $60 and the Zojirushi Virtuoso Breadmaker for $270. Big diff in price! 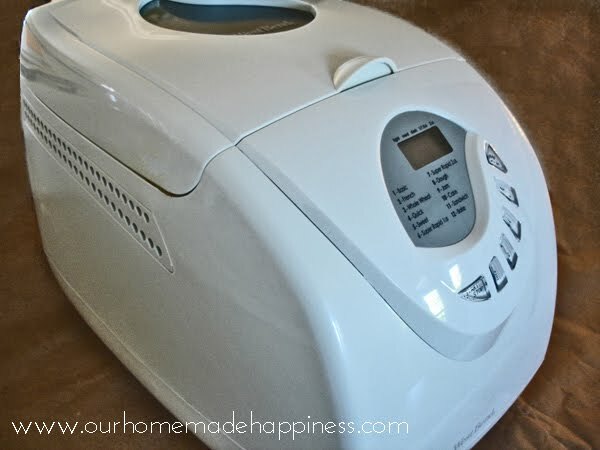 I read all the user reviews for each bread maker and I finally chose the less inexpensive West Bend bread maker. I've been very happy with it and I'm glad I didn't fork over the extra $210 for the Zojiushi model. After making homemade bread in my bread maker 20 times, I saved the $60 I spent on it. I also make homemade pizza dough and french bread dough in it. I love that I get fresh, delicious, nutritious homemade bread without hardly lifting a finger! Do you have a bread maker? What kind do you have and how do you like it? 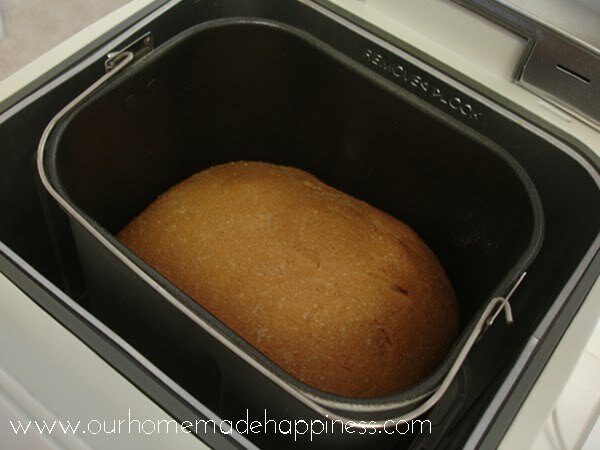 Do you have a favorite bread machine recipe to share? Oh man I think I need a bread maker! I got together with two friends to make homemade bread, but even with three of us it took so long and was a lot of work. This would be so much easier! Kendra, you are amazing! Ditto to Marci's comment. I have a tiny kitchen and generally don't like appliance clutter, but people who use bread machines seem to rave about them, and unlike many, I don't find making bread by hand relaxing...it seems like a messy, time consuming task and I have trouble getting it to rise. Thanks for the advice on what to buy! Oh, I do have a question. I've heard about vertical vs. horizontal loaves - that the vertical ones make a much smaller loaf which is a drawback. But I think the horizontal ones are more expensive. Maybe a larger loaf would just go to waste from drying out before you could use it, anyway. Any thoughts? My West Bend bread maker is not expensive and it makes a horizontal loaf. It can make a 1 1/2 pound loaf or a 2 pound loaf. I prefer the 1 1/2 pound loaf because the slices of bread are the right size. When I make a 2 pound loaf, the slices are too tall and it's a little awkward to fit in the toaster. My previous bread maker made a vertical loaf. It seemed the vertical loaf was the same size as my West Bend horizontal 1 1/2 pound loaf. Hope this helps! This is great, Kendra! I have been wanting to ask for a bread machine for my birthday in September, and now I know which one to buy! Thanks. I use my bread machine for making my dough, but I bake it in the oven. I just don't care for the hard dark crust when baking in the machine. It makes wonderful dough of yo have a good recipe. I have made it with a big mixer, but my dough is better from the bread machine. Oops!!!! That would be if you have a good recipe. I have tried different bread machines including Sunbeam and Welbilt. I haven't noticed that much of difference between the brands but more in the pan size. I have an oblong pan and a square pan. I found that the square pans mixed better and created a better dough. I don't like the texture of the bread when it cooks in the maker so I tend to use my machine for making the dough and then shape the loaves and bake them in the oven. Your wheat bread recipe looks great. I can't wait to try it out, but I'm not going to try until the heat breaks a bit. Janelle, That's good to know you like the square pans better. Thanks for your comments! Just scour the yard sales. I got mine for $5.00 and it came with the recipe book & manual, new in the box. I've seen them every week since, sometimes $5, sometimes $10, but gee.. that's a workable about of money. Thanks for the tip! My mom finds so many great appliances at garage sales too. Oh I love this and will have to pin it and make it soon. Love my bread machine, thanks so much! Just stopping by to say HI! Found your blog via Red, White and You. I am following you now. Looking forward to reading your future post. Love this...I'm a new stay at home mama and I think I see a bread machine in my future. New follower from Red, White and You blog hop. Thanks for trying the recipe and sharing it on facebook! :) I'm looking forward to trying your homemade ranch dressing recipe. Oh this looks so good! But what if you don't have a bread machine? Is there a comparable oven version? I'm following you from the follow fest! I'd love for you to stop by my blog and become my blog friend too! Hi Brooke, I've never made bread without my bread maker so I don't have a comparable oven version. Sorry! Mel's Kitchen Cafe has an awesome post about her 3 favorite whole wheat bread recipes that she makes in the oven. Thanks for stopping by! I can almost smell the bread from the picture! It looks great. Thank you for sharing with us on Saturday Show and Tell. I hope you'll join us again this week! The bread looks lovely and delicious. I would love to make some but then I would just eat the whole loaf myself! Your blog is nice also! Going to look at some of your homemade cleaners! Thanks for sharing. That bread looks amazing! Man, I really need a bread machine. Thanks for sharing the one you have, think I'm going to order one this week :) Thanks for linking up at Tiny Tip Tuesday! I don't have a bread machine, but I have a Kitchen Aid stand mixer (the big one) that I love. It does all of my kneading for me. I'm thinking of making this as an oven bread. I'd just do the mixing and kneading in my stand mixer, proofing in the bowl, then final rise and bake in a bread pan. Do you think it will work? Hi Amy Sarah, I've never made bread without my bread maker so I'm not sure if it will work. Sorry! I suggest checking out Mel's Kitchen Cafe. 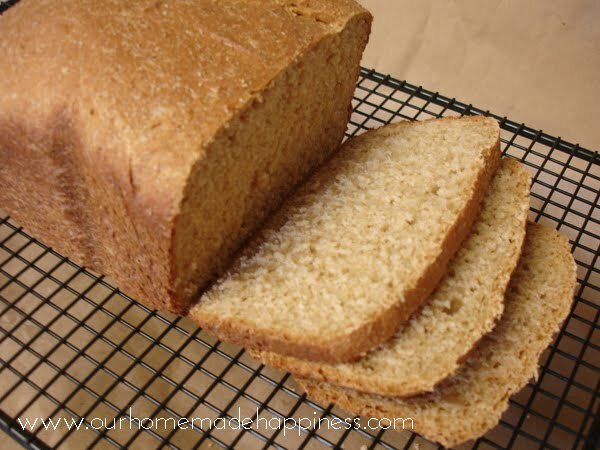 She has a great post about her 3 favorite whole wheat bread recipes that she makes in the oven. I so need a bread machine. Glad to hear the $60 version works great since I have been eyeing that expensive one too. Thanks so much for sharing on Tout It Tuesday! Hope to see you tomorrow. That is some savings! It looks delicious and I would love a slice right now, lightly toasted with some soft butter. Thanks! :) Thanks for joining Foodie Friends Friday! Please come next week with another great recipe! This looks wonderful! Thanks for linking up to Foodie Friends Friday! Found you from Foodie Friends Friday! I just got a bread machine myself and am going to try this recipe as my first loaf! You are my host favorite, so I will be shouting out your link this friday on my page (familyfoodfinds.com)! Thanks for linking up! Thanks for the shout out Lindsey! Hopefully your bread turns out tonight or that might change. :) He he. I love my bread machine. I try to purchase most items at my local thrift store. Reduce reuse recycle. I get gently used or new items at an incredible price while contributing to a wonderful community organization. That's awesome! Thanks for sharing! I was able to find a Zojirushi at my local thrift store for $20! I was ecstatic. I tried this recipe and the taste was incredible. WE all loved the moistness, and texture and flavor. My only complaint is that the bread didn't rise very well. I ended up with a concave loaf. I used the SAF instant yeast, do you think I should use the bread machine yeast? Also, what other sweetener can I sub if I don't have honey on hand? Hi Soccy, That's awesome you scored one for such a good deal!! Did your bread maker come with instructions? Make sure and read the instructions to find out what order to put the ingredients and what temperature water to use and any other recommendations. Your instant yeast should work fine in a bread maker. Make sure it's not old. Bread recipes using only whole wheat flour can have a hard time rising because of low gluten content. You could try substituting 1 cup of whole wheat flour for 1 cup of bread flour. Or you could add 2 Tbsp vital wheat gluten and 2 1/2 Tbsp water. Make sure your liquid isn't too hot. Too much salt or not enough sweetener can inhibit rising. Did it rise and then collapse? Too much yeast or water can cause bread to collapse. Do you live at high elevation? If so, reduce yeast by 1/4 teaspoon and reduce liquid by 1-2 teaspoons. I haven't ever substituted the honey, but I think maple syrup would work. You could use sugar, but then you have to add more liquid. Good luck! Kendra, are you still happy with this bread machine? Because I'm about to buy the one you recommended. Thanks! Yes, I still love it! I don't recommend Trader Joe's white whole wheat flour though. My bread doesn't rise as much when I use it. I've had good success with Gold Medal white whole wheat flour. I made your Wheat Bread today.. Served them with carrot soup and they were a huge hit. So easy too! I really want to try making bread sculptures. I hear it's easier to work with white flour than wheat. Bread is amazing, I like it, but I've always bought it. I'm...not so great in the kitchen, for lack of experience. But bread shouldn't be too hard, right? There’s nothing like a homemade wheat bread and yours looks simply fantastic!! Homemade bread is the best! Do you think regular whole wheat flour will work just as well? Sounds really yummy with the milk, honey and all and the bread machine! It's the first time I heard. HI I am baking my second loaf now, the first is soo good! Thanks a bunch! Anyways i wonder if you store yours in the fridge and how long you would say it keeps for. I want to keep one here and send one to daycare for my daughter with dairy/soy intolerances! So grateful to save 4.00 a loaf to make my own bread!! I'm glad you like it! No I don't keep the bread in the fridge because it would get too dry. I just leave it on the counter. If you won't be able to eat it fast enough, slice it and store in the freezer. When you want a piece, you can toast it or thaw it in the microwave for 1 minute on 4 power.